The unemployment picture has been unrelentingly gloomy for some time now. 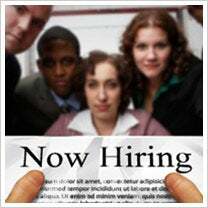 But one recent study shows that more than 40 percent of small businesses plan to hire in the next six months. Top jobs in demand? Sales and marketing -- nearly half of business owners making hires said they were looking for more staff in this category. Could this be the start of a turnaround in unemployment? We'll see. Beyond the glimmer of hope for jobs, the Pepperdine Private Capital Markets Project's fall 2011 study of more than 7,500 businesses with revenues of less than $5 million provides an interesting look at what's keeping other small businesses from bringing on more staff. It turns out that the list of initiatives for stimulating job creation being pitched by the White House, the U.S. Chamber of Commerce and others only partly addresses entrepreneurs' most pressing problems. The business owners surveyed agreed that tax incentives would help -- 23 percent liked that idea. But the top response seems to be absent from many legislators' agendas. Nearly 35 percent of respondents said "increased access to capital" would be the change most likely to spur small-business job creation, with bank loans preferred by the vast majority. Loan stimulus and increased SBA guarantees intended to help small businesses tough out the recession expired more than a year ago -- likely far too soon. In the study, more than 1,600 business owners reported they sought a bank loan in the past year, but fewer than half were successful. The owners reported they contacted an average of 2.2 banks and spent between 16 and 24 hours of their time pursuing their loan, making borrowing fairly burdensome and a task with a dubious outcome. Many more owners have stopped trying to get a loan -- which is, in turn, stifling hiring. If you want to weigh in on the Pepperdine study, the survey is ongoing through Sept. 16. What would it take to enable your business to hire more workers? Leave a comment and tell us your plan.